More water for cooking it. Traditionally, the head of cocoyams are used for Cocoyam Fufu but if you cannot buy it where you live, you can use cocoyam corms. The cassava flour serves as a binder for the cocoyam fufu. Cocoyams are soft and sticky when cooked and pounded on their own, they need a binder to make them mouldable. Peel, rinse and cut the cocoyams into medium cubes. Put in a pot, pour water to cover the pieces of cocoyam and start cooking on medium heat. While that is cooking, mix the cassava flour with half cup of water till a mouldable mix is achieved. Mould into small balls and set aside. See the video below. 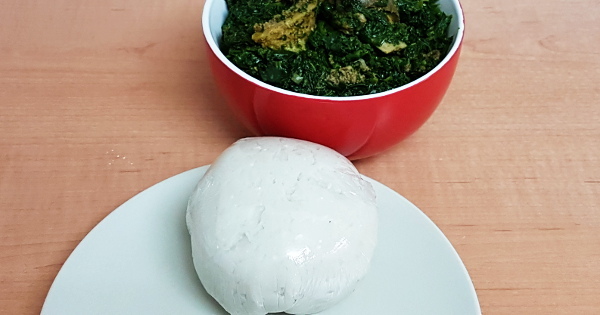 After 10 minutes of cooking the cocoyams, add the balls of cassava flour and continue cooking for another 10 minutes or till you can easily drive a knife into the cocoyam pieces. Remove from the stove and pound the cocoyams and cassava together in a mortar till a smooth ball of dough is achieved. You can also try using a blender to mix it but do not add water. Cocoyam Fufu is best served immediately after preparation because it becomes soft and loses its elasticity over time. Serve with your favourite Nigerian Soup. Click here for all Nigerian Soups.